Filed under apple on July 31, 2017. You compose a message in Apple Mail and send it to a recipient. You then later find that the recipient prefers future messages sent to a different email address. When you compose your next message to the recipient, the old address appears as you start to address the new email. You enter the new address; however, the third and subsequent times you compose a message to the recipient, autocomplete shows both addresses. If you are not careful, you will repeat your original error and select the non-preferred address. How do you get rid of the old address? 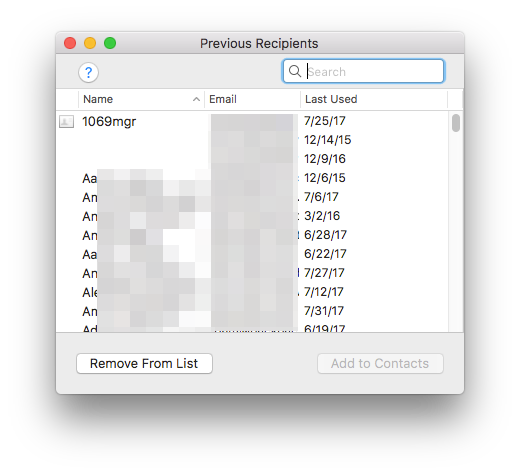 From the Apple Mail pull-down menu, chose Window / Previous Recipients - Apple Mail will display the Previous Recipients window shown in the image below. When you create a new email message (⌘ + n) and begin to enter an email address, the incorrect recipient’s email address should no longer appear. This is an easy fixes; however, it was very bothersome and it took me awhile to find the solution. Now the solution will be just a Google search away for some else struggling with the same issue.